WiFi covers almost everywhere we go, airport, office, library, hotel, coffee shop, restaurant and more, among which some offer free WiFi access to the public. It is enjoyable for iPad and iPhone users to get the device connected with WiFi to surf the Web, check e-mail, update blog, send instant message etc. Actually, you can make more use of WiFi- streaming video to iPhone iPad via WiFi to watch video stored on remote computer. Suppose you have to leave home to catch the airplane or to meet a friend, yet there is no enough time to convert the video and sync it from iTunes to your iPhone or iPad, you are still able to watch them with your device via WiFi. 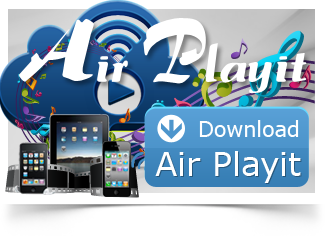 The only app that you need is Air Playit. Air Playit is free video streaming software that is developed for streaming videos in almost any format from your PC or Mac to your iPhone iPad over WiFi network. 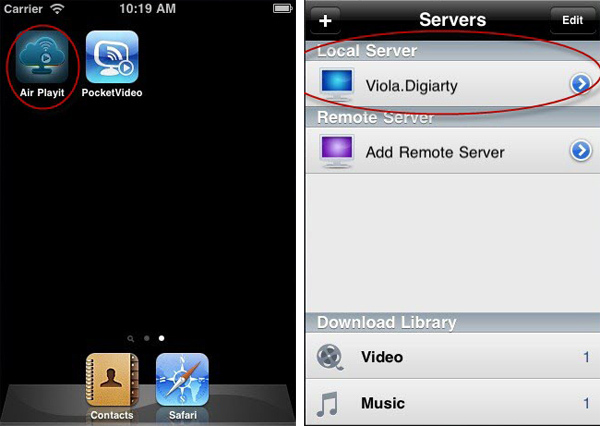 It is capable of accessing the video on the remote computer and streaming video to your device as your personal audio video cloud server. With this free video streaming software installed, you can simply enjoy the benefits. * You do not need a traditional video converter to convert the videos to MP4 or H.264 anymore. * No need to sync the video from iTuns to iPhone iPad. * When streaming video to your device via WiFi, Air Playit live converts the video automatically so you are able to watch the video immediately. 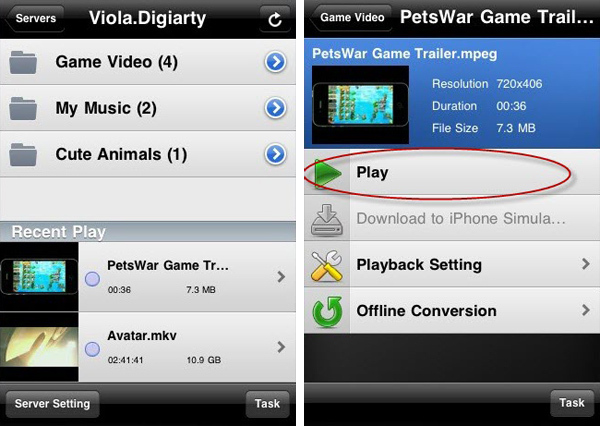 First of all, let us make the foremost preparation before streaming video to Apple device: download Air Playit, install Air Playit server on your PC or Mac and Air Playit client app on iPhone or iPad, and then follow the simple steps as below. 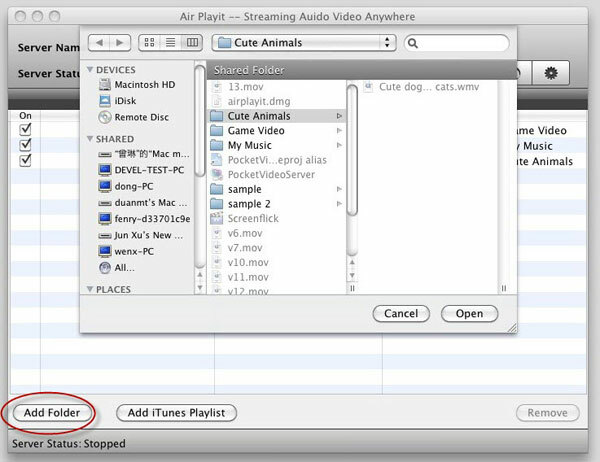 Step One:Run Air Playit server and add the videos on your PC or Mac to share. Click “Shared folders”, and then “Add Folder”. Step Two:Run the client app and add your server. Please make sure that your iPhone or iPad is connected with WiFi network. The client app can automatically discover the local network by Bonjour Server. If sometimes it fails, you need to specify the server address manually or close the firewall for a try. Step three:Browse the folders under the server and tap the video that you want to play, click “Play” and you have done all the steps of streaming video to iPhone iPad via WiFi. Just watch the video stored on your Mac or PC wirelessly with your Apple device.